Off the Caribbean coast of Panama lies a constellation of approximately 365 islands known collectively as the Guna Yala Comerca: it is the land where the Guna tribe lives. Some of the islands are owned by locals but uninhabited: sand and palms rising from the sea, places to swim or gather coconuts. 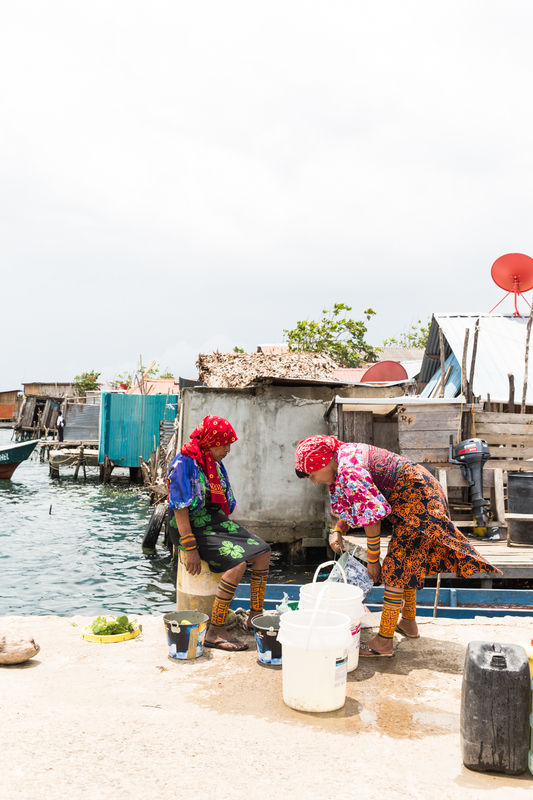 Other islands are inhabited by densely packed communities of Guna families, with thatch homes built to the very edges of the islands, sometimes built over and above the water. In Guna communities, decisions are made collectively. Each week, problems are brought to the congress house during a series of meetings overseen by sailas, or tribal elders. They talk about how to manage fish populations, how to grow crops and care for children, they mediate quarrels between neighbors. These days, there are new, unprecedented problems brought on by changes in the environment. There has been too little rain. It is not enough to fill the water tanks or water the crops. Sometimes, parts of the island are flooded, the seawater rising to the knee and crossing the thresholds of homes. The sea seems too hot for the fish, and the storms seem to get stronger and stronger. The new problems exist alongside a loss of traditional knowledge, increasing influence from the cities, and overpopulation. The communities must make new decisions: what to do with the unpredictable environment and where to go when the sea begins to swallow the islands. According to a report by Displacement Solutions, it is estimated that 28,000 people in Guna Yala will eventually need to relocate. This story focuses on two island communities: Gardi Subdub and Coetupu. Gardi Subdub is an island closest to the highway on the mainland that leads to Panama City, an island with a cell phone signal and a small supermarket. Because of the rising sea and the growing population, the island’s congress has decided to relocate. The community has already begun building a new community on the mainland: a short drive into the hills where a new school building is almost completed. Next, they will begin to build homes. Six hours by boat from Gardi Subdub is the island of Coetupu: it is more remote, more traditional. People wait in line to use one of two pay phones to call their families in the city. There, they are drafting plans to relocated to an adjacent island. They worry if the sea and land will continue to sustain their families and community. "Young people, they are going to suffer the consequences. Governments, politicians, big countries should think about the relationship between people, not only indigenous people but all around the world. The problem is that as long as the social system doesn’t change we will continue to have problems. The rich countries only work to more and more money, and they want to dominate. There’s no equality. Poor countries are becoming even poorer. The system has to change. The resources, the wealth that God created, only few are taking advantage of it and only a few are protecting it." Saila Leonidas Perez in his home on Coetupu. Guillermo Archibold, agronomist, in his home in Gardi Subdub. The streets of Gardi Subdub after a light rain. The construction site at the "Nueva Barria"- the new community being built on the mainland near Gardi Subdub. The new school building is projected to open this year, with construction of the residential community to be built next. The Panamanian government began construction of a new health center, but the building has been sitting unfinished for years. Victoria Navarro, community leader working to organize the relocation to the "Nueva Barria" in her home in Gardi Subdub. Saila Leonidas Perez by a dry water reservoir on the mainland near the Coetupu community. "The Guna, we have a coast full of forest. And we know it captures carbon from the air, so we protect it, while developed countries have destroyed forests. In other places, there’s a lot of pollution and big industries, oil, and big planes. And that’s the principal cause of global warming. Indigenous people and poor people like us are keeping forest, helping in controlling heat. Now that big countries are discussing issues of climate change, they should prioritize to helping poor countries to protect our forests." A portion of this story was photographed for and published by Orion Magazine. La Wayaka Current, Macarena "Macay" Yanez, Tasha Aulls, Héctor Lara, Sofie Iverson, Victor Fernández, and Naidi Robinson.